This assumes you already have an Amazon Associates account. Why separately track Amazon.com affiliate earnings? If you try to monetize multiple websites—blogs, podcasts, communities, and such—then you need to see how each site is performing. Is your personal blog earning any money from its affiliates? Do people buy your recommendations from your podcast? When you look at your Amazon.com affiliate report or see the payout, you will initially have no idea what earned that income. 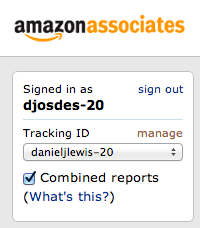 With separate Amazon tracking IDs for each site, you could segment your earnings easily and automatically. Why not create separate Amazon affiliate accounts? If you have ten websites each with their own Amazon.com affiliate accounts, then each website needs to refer enough volume in order to reach higher commission rates. Separate accounts also mean logging in and out of Amazon.com in order to track each account's performance. This becomes even more cumbersome if you use international Amazon affiliate programs (like Canada, United Kingdom, and others). All you need to do is create separate Amazon tracking IDs. Login to your Amazon.com (or other Amazon domain) affiliate account. Enter the ID you want to use. I recommend your domain without the “.com” or similar. If you're making similar tracking IDs for the separate international Amazon affiliate stores, then I suggest adding the Amazon's top-level domain (TLD, the “.com,” “.ca,” “.es” part). For example, my USA affiliate idea for my personal blog is “danieljlewis”; for Canada, it's “danieljlewisca”; for the United Kingdom, it's “danieljlewisuk”; and so on. Amazon will add the appropriate “-20” or similar number. It doesn't cost anything to make extra tracking IDs. Income from all of your separate tracking IDs contribute to your core affiliate earnings, so you may earn a higher commission rate. When you have your separate Amazon tracking IDs created, you can select it from the Amazon associates page, or when you create a link with the Associates toolbar on the main Amazon site. To confirm that you're using the right tracking ID, look for “tag=AFF_ID-20” in your embed code or link URL. Where “AFF_ID” is your tracking ID. This is what you would change if you need to fix old URLs or accidentally used the wrong ID in a new URL. For even more power and faster affiliate-link creation on WordPress, I recommend EasyAzon Pro and Fresh Bundle Master. Watch my video, from The Audacity to Podcast, to learn more about setting up and using these powerful plugins. After you have your separate tracking IDs created and implemented across your properties, you can start tracking the separate earnings in your Amazon affiliate account. The report defaults to “Yesterday,” but you can select a different time period. In the upper-left corner, under the logo, select the tracking ID you want to view. Just below the previous step, uncheck “Combine reports” (this option is only visible on a report page). View the homepage or any report you want to see just the tracking ID's performance. In the upper-left corner, under the logo, check “Combine reports” (this option is only visible on a report page). View the homepage or any report and you'll see all tracking IDs combined. Many other affiliate programs, such as Commission Junction, allow you to set similar tracking IDs. They may be called websites, campaigns, or something else.